We have previously reviewed a number of the Casdon products on offer and Elise has really enjoyed playing with all of them. 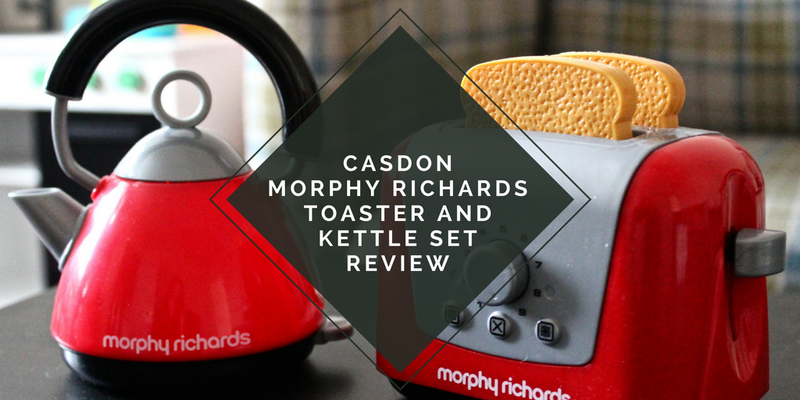 This month we were lucky enough to get the chance to review the Casdon Morphy Toaster and Kettle set in a lovely red colours. Elise has been a little bit addicted to her Hetty Deluxe Cleaning Trolley, changing mat set and her grocery set so we were pretty confident that she would also love the Toaster and Kettle set. The toaster and kettle set from Casdon (in association with Morphy Richards) comes in a lovely bright red colour and also comes with two pieces of bread ready to pop in the Toaster. You are able to remove the lid from the kettle and fill it with liquid. To turn on the kettle, you simply click down the button on the side. The kettle doesn't make any noise apart from the clicking sounds. The set also has a toaster which is also red. You are able to turn the dial on the front, and there are two pieces of bread included in the set. You can easily push down the bread, but Elise did need a little bit of help with this. It is important for me to say that Elise is a little bit younger than the recommended age of 3. The toast then pops up from the toaster after a bit of a delay. We found that the kettle and toaster helped with hand and eye coordination. It is quite hard to place the lid back onto the kettle as the handle gets in the way a bit. This meant that Elise had to really concentrate. Also the delay in the toast popping up has taught Elise about waiting and that sometimes you have to be patient! Role playing is a key feature in all of Casdon's products and this one didn't disappoint. Elise is obsessed with making tea and having picnics. She is so used to seeing her dad make himself a hot drink that she associates the kettle with him and is constantly making us all a brew. We were also able to teach her that hot things come out of the kettle so when she pours a drink she says "Hot, Hot". The photo below shows Elise learning that larger bread doesn't fit into the toaster! 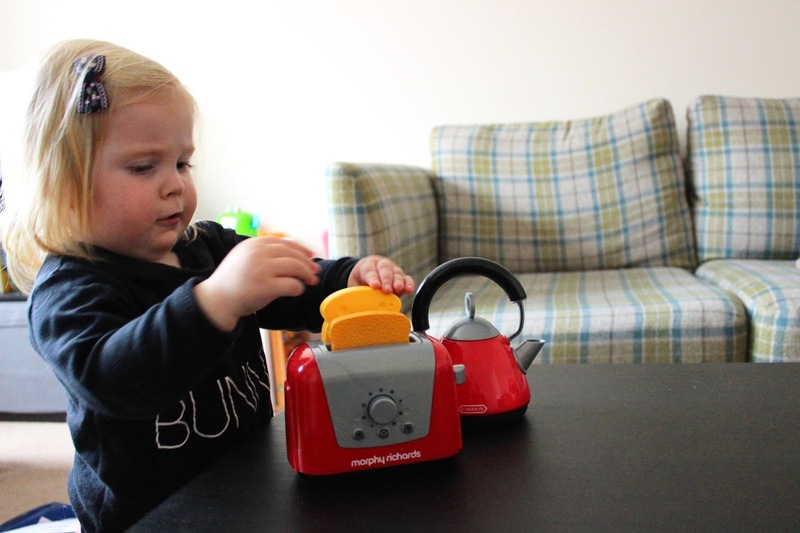 Elise really enjoyed playing with the toaster and kettle set and we love the bright red colour. The branding on the items is not too large and "in your face" which we liked as we have found some products to have large branding on them. The colour is very unisex so there would be no complaining from anyone. We loved how interactive this was, but one thing Elise missed was the sound of the kettle. We do have another toy kettle that makes boiling and whistling sounds so I think she was expecting this kettle to do the same. The delay in the toast popping up may also be a bit too long for some impatient little ones. We had to call Elise back once the toast had popped up on a few occasions, or she tried to take the toast out herself. 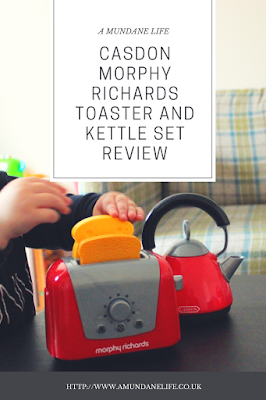 Overall we would recommend the kettle and toaster set, but for some aspects of the toy, it definitely fits the 3-8 age range. 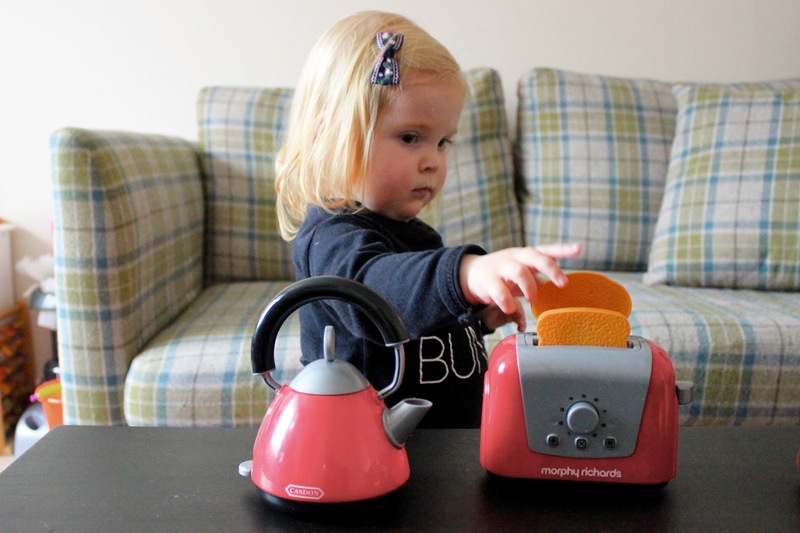 The Toaster and Kettle set has an RRP of £9.99 and can be purchased here. 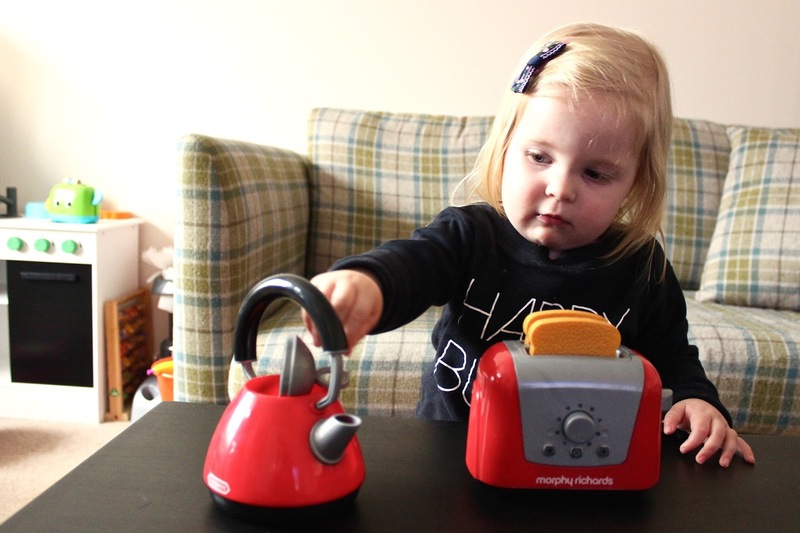 WE WERE SENT THE CASDON TOASTER AND KETTLE SET IN EXCHANGE FOR AN HONEST REVIEW. THIS WEBSITE USES AFFILIATE LINKS. FOR MORE INFORMATION, PLEASE READ MY DISCLOSURE POLICY.